The 1994 European Super Cup was a football match played over two legs between Arsenal of England and Milan of Italy. It was the 20th staging of the European Super Cup, a fixture between the winners of the UEFA Champions League and European Cup Winners' Cup. 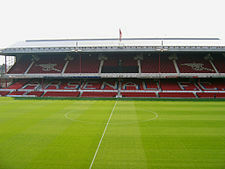 The first leg was played at Highbury, London on 1 February 1995 and at the San Siro, Milan a week later for the second leg. Milan won the Super Cup 2–0 on aggregate. The teams qualified for the competition by separately winning the 1993–94 UEFA Champions League and 1993–94 European Cup Winners' Cup. Milan won the former, beating Barcelona 4–0 in the final. Arsenal qualified as winners of the Cup Winners' Cup; in the final of the competition they defeated Parma by a single goal. This was the first official meeting between both clubs in European football. Milan's preparations for the Super Cup were blighted by the death of Vincenzo Spagnolo, a Genoa supporter who was stabbed on his way to watch the two teams play. Once news of his death had arrived, the match was abandoned and the Italian football calendar was suspended for a week. Milan and Arsenal paid respect to Spagnolo by observing a minute's silence before the first leg. A crowd of 38,044 witnessed both clubs play out a goalless draw at Highbury; the first leg marked the return of Paul Merson, who spent time away from football in order to seek treatment for various addictions. A significantly lower crowd at the San Siro saw Milan dominate in large periods and win courtesy of goals from Zvonomir Boban and Daniele Massaro. Arsenal qualified for the Super Cup as the reigning European Cup Winners' Cup winners. It marked their debut in the event. Arsenal had conceded only three goals throughout the 1993–94 staging of the Cup Winners' Cup, and beat Italian side Parma by a single goal to win the final. The other Super Cup place went to Milan, winners of the 1993–94 UEFA Champions League. Milan defeated pre-match favourites Barcelona 4–0 in the final, a result which earned the club their third top European honour in six years. Milan were appearing in the event for the fifth time; prior to the game against Arsenal, they had won the Super Cup in consecutive years (in 1989 and 1990), and were on the losing side twice (in 1973 and 1993). This was first meeting between the two sides in competitive European football. Neither match was televised live in the United Kingdom, though highlights were shown on Carlton (the London-based ITV company), Channel 4's Football Italia and Sky Sports. Live radio commentary of the second leg was scheduled to be broadcast during Trevor Brooking's Football Night on BBC Radio 5 Live but was replaced by an FA Cup fourth-round replay between Wolves and Sheffield Wednesday. Ron Jones did however provide reports on both matches for Five Live. The first leg was held at Highbury on 1 February 1995. Milan's preparations were overshadowed by the violence that occurred in their last domestic fixture, against Genoa three days ago. Clashes between both sets of supporters resulted in police intervention and the use of tear gas. 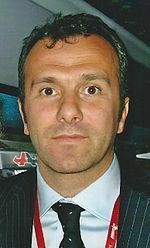 Vincenzo Spagnolo, a Genoa supporter, was stabbed prior to kick-off and subsequently died while receiving treatment. The match was later abandoned once word was sent to the players and staff during half-time. Milan manager Fabio Capello admitted his players were deeply affected by the incident and struggled to focus on the Super Cup match. He told reporters: "I believe that the psychological balance of each player has been damaged by Sunday's tragedy. Our team was in great condition until Sunday. But in the past few days I have had to wake up the players. So I'm not able to anticipate which kind of Milan you will see." 800 Milan supporters travelled to London, and Capello denied reports a section of them intended to cause trouble. Paul Merson returned to the Arsenal squad, after his much-publicised cocaine, alcohol and drug addiction. The England international, who was admitted to a rehabilitation clinic for treatment during his absence, started on the substitutes' bench. Arsenal lined up in a 4–4–2 formation, with Ian Wright paired alongside John Hartson upfront and Kevin Campbell shifted on the right of midfield. Milan lined up in a similar formation, with Marcel Desailly and Demetrio Albertini anchoring the midfield. A minute's silence was observed before kick-off in memory of Spagnolo; as is tradition in Italian football, the Milanese supporters clapped throughout to pay their respect. The game itself was lacklustre and was described as a "training match," lacking in "fervour and commitment" by The Times football correspondent Rob Hughes. There were few clear-cut chances created by both teams, and neither managed to score over the 90 minutes. Both however looked assured defending; Milan triggered the offside trap on several occasions, while Arsenal were boosted by club captain Tony Adams playing his first full match in two months. Manager George Graham assessed afterwards: "It was back to the Arsenal of old. We were very solid." Glenn Moore, of The Independent felt Milan would have won had they finished better, noting Dejan Savićević's tame volley in the 75th minute. Marco Simone twice hit the ball wide, while a free-kick from Albertini forced Arsenal goalkeeper David Seaman to action. The home side's best chance came from Wright in the 36th minute. He picked up the ball from Arsenal's half and proceeded to run, evading the challenges of several Milan players. His shot at goal was smartly saved by Sebastiano Rossi. Further chances went to Hartson, who headed from a Stefan Schwarz's corner, and Steve Bould, before Campbell broke forward and had his effort blocked by the Milan goalkeeper. Merson's introduction in the 74th minute was cheered by the Arsenal supporters, as was his every touch of the ball. He admitted he was overwhelmed by the occasion, adding post-match: "It was a great feeling to be in action again and I thank all those who've made it easier for me. This is the first step back." The second leg was held at the San Siro on 8 February 1995. It marked the resumption of football in Italy, as play was abandoned for a week in memory of Spagnolo. The incident at the San Siro prompted Milan to use security measures usually reserved for high-profile matches. Ugo Allevi, the club spokesman however downplayed reports security was heightened: "There won't be any special security measures for them. They will all be housed in a special sector of the stadium, segregated from the Milan fans. What we're most concerned about is how our fans behave." 15,800 tickets were sold the night before the match, 13,600 of which were purchased by Milan supporters. Allevi admitted this was a repercussion of the violence in their last home game; "People are scared to come to football at the moment." Milan entered the match the fresher of the two teams, but Simon Barnes commented in his Times match preview that Arsenal's biggest asset was their "sheer bloody mindedness." The club's indiscipline was a major talking point before the game, as two players were sent off in defeat to Sheffield Wednesday the previous Saturday. Graham's future was also called in question, after claims that he received illegal payments from transfer deals (bungs), which he dismissed. [n 2] In his pre-match news conference, the Arsenal manager spoke highly of European football and was eager to win another trophy for the club: "We are having a bad season by our standards and any win in any cup is worth something." Merson came in place of John Jensen in Arsenal's starting XI, while for Milan Zvonimir Boban replaced the suspended Simone, and Christian Panucci was chosen to stand in for Paolo Maldini. Graham deployed a 4–1–4–1 formation, with Schwarz acting as the lone defensive midfielder and Hartson positioned the furthest forward. Watched by a crowd of 23,953, Milan eased to a 2–0 win and in the process ended Arsenal's 15-match unbeaten run in Europe. The home side's first goal came minutes before half-time, when Daniele Massaro's defensive-splitting pass found Boban, who scored, despite Schwarz's attempts to hold him back by tugging his shirt. The Croatian forward nearly scored a second, but for Seaman's quick intervention. Up until then, Arsenal had briefly threatened; from a long ball in the 19th minute, Hartson managed to turn Franco Baresi, but scuffed his shot wide. Milan found it easy to contain the opposition, given Desailly and Savićević influenced the tempo of the match. The latter came close to doubling Milan's lead when he broke forward and hit a shot goalwards, only for Seaman to divert the ball round the post. In the second half, Wright thought he had equalised for Arsenal when he tapped the ball in, but the referee disallowed the goal as there was infringement in the build-up. Milan continued to attack and extended their lead soon after; from Savićević's corner, Massaro jumped higher than his marker Lee Dixon and headed the ball into the Arsenal goal. Dixon, who required treatment early in the second half, was substituted for Martin Keown right away as he struggled to play on. The home side's performance was lauded by journalist Russell Thomas, who opened his match report in The Guardian with the line "Milan produced football of ease and elegance way beyond the English capabilities." By contrast, Moore noted Arsenal had "looked a different side from the sterile and nervous one seen in domestic matches." Graham described Milan as "... the best team in Europe, or in the world. We've learnt a lot. But we could have given them a better game, though, and I am disappointed." Capello was content with Milan's win, and believed his team were "still about two months where we should be." It was his eighth trophy as manager of the club, one better than his predecessor Arrigo Sacchi. He said of the achievement: "The mentality of this great club is passed on from the older players to the younger players, so they learn self-sacrifice and how to fight for every trophy they go for." Arsenal and Milan went on to reach the 1995 finals of the UEFA Cup Winners' Cup and UEFA Champions League respectively, though failed to retain their titles. Arsenal lost in extra time to Real Zaragoza, while Ajax beat Milan by a single goal. ^ In 1972, Rangers was banned from European competition for two years after fans clashed with Spanish police while celebrating the club's victory over Dynamo Moscow in the European Cup Winners' Cup Final. The ban was later reduced to one year on appeal. ^ Near the end of February 1995, Arsenal terminated Graham's contract once his financial impropriety was uncovered by a Premier League investigation. In a statement the club's board concluded that "Mr Graham did not act in the best interests of the club," and he was swiftly replaced by Stewart Houston. Foot, John (2006). Calcio: A History of Italian Football. London: Fourth Estate. ISBN 0-00-717574-4. ^ a b c d "Club competition winners do battle". Union of European Football Associations (UEFA). Retrieved 24 November 2015. ^ Wilson, Jonathan (13 May 2008). "'The behaviour of the Scottish fans was shocking and ugly'". The Observer. London. Retrieved 24 November 2015. ^ "Arsenal complete cup finals". Statto Organisation. Archived from the original on 4 March 2016. Retrieved 24 November 2015. ^ "GGM 20: Gunners stun Parma in Copenhagen". Arsenal F.C. 23 August 2007. Archived from the original on 4 April 2016. Retrieved 24 November 2015. ^ "Arsenal results, 1993–94". Arseweb. Retrieved 24 November 2015. ^ Thomas, Russell (19 May 1994). "Milan press on to a convincing victory". The Guardian. London. p. 24. ^ "AC Milan". Union of European Football Associations (UEFA). Retrieved 24 November 2015. ^ "Arsenal's head-to-head comparison with AC Milan". Statto Organisation. Archived from the original on 25 November 2015. Retrieved 24 November 2015. ^ "Television listings for terrestrial TV". The Times. 1 February 1995. p. 43. ^ "Television listings for terrestrial TV". The Times: Vision. 4 February 1995. p. 11. ^ "Television listings for satellite TV". The Times. 8 February 1995. p. 47. ^ Barnard, Peter (4 February 1995). "What radio is all about". The Times. p. 24. ^ "Results on Wednesday 1st February 1995". Statto Organisation. Archived from the original on 26 December 2015. Retrieved 10 January 2016. ^ a b Foot 2006, p. 343. ^ Phillips, John (31 January 1995). "Italy halts sport as football fan dies". The Times. p. 12. ^ a b "Milan in a trance". Daily Mirror. London. 1 February 1995. p. 26. ^ "Opportunism knocks loud in Super Cup". The Times. 1 February 1995. p. 26. ^ a b c d Curry, Steve (2 February 1995). "Milan maestros deny Merson a fairytale return". Daily Express. London. p. 73. ^ a b c d e f Moore, Glenn (2 February 1995). "Highbury welcomes Merson back". The Independent. London. Retrieved 10 January 2016. ^ a b Hughes, Rob (2 February 1995). "Arsenal draw comfort from Merson's return". The Times. p. 44. ^ Thomas, Russell (2 February 1995). "Arsenal show Merson to Milan". The Guardian. London. p. 18. ^ Clarke, Nigel (2 February 1995). "Hope and glory; three tears, Paul". Daily Mirror. London. p. 40. ^ "Results on Wednesday 8th February 1995". Statto Organisation. Archived from the original on 26 December 2015. Retrieved 10 January 2016. ^ a b c Barnes, Simon (8 February 1995). "Graham finds purpose in Arsenal's European detour". The Times. p. 44. ^ a b c Moore, Glenn (8 February 1995). "Arsenal draw strength from adversity". The Independent. London. Retrieved 10 January 2016. ^ a b Thomas, Russell (8 February 1995). "Merson 'ready' to face Milan". The Guardian. London. p. 16. ^ Lacey, David (22 February 1995). "Arsenal manager vows to fight his dismissal". The Guardian. p. 1. ^ Hughes, Rob (22 February 1995). "Arsenal make Graham pay ultimate price". The Times. p. 48. ^ Hughes, Rob (23 February 1995). "Arsenal call on Houston to calm storm surrounding Highbury". The Times. p. 44. ^ a b c d e Moore, Glenn (9 February 1995). "Limited Arsenal exposed by Milan". The Independent. London. Retrieved 10 January 2016. ^ a b c Thomas, Russell (9 February 1995). "Milan the masters". The Guardian. London. p. 18. ^ a b c Harris, Harry (9 February 1995). "Taking the pizza". Daily Mirror. London. pp. 36–37. ^ a b Barnes, Simon (9 February 1995). "Milan the masters". The Times. p. 48. ^ Barnes, Simon (10 February 1995). "Aimless Arsenal take their eye off the greater cause". The Times. p. 38. ^ Thomas, Russell (10 February 1995). "Graham goes Dutch for fresh skills". The Guardian. London. p. 20. ^ a b Moore, Glenn (10 February 1995). "Milan teach a salutary lesson". The Independent. London. Retrieved 10 January 2016. ^ "1994–95: Nayim's bolt from the blue sinks Arsenal". Union of European Football Associations (UEFA). 1 June 1995. Archived from the original on 22 August 2010. Retrieved 25 May 2016. ^ "UEFA Champions League 1994–95 – History". Union of European Football Associations (UEFA). Retrieved 24 November 2015. "Flashback: Milan triumph in 1995 Super Cup". Arsenal F.C. 18 February 2008. Retrieved 24 November 2015.